Excellent low/low-mid balance of the DM1B. Forward yet balanced mid range of the DM1S/T. Distortion-free high SPL handling (DM1B). The drum rim mount on the DM1S/T models can be tricky and awkwardly positioned. 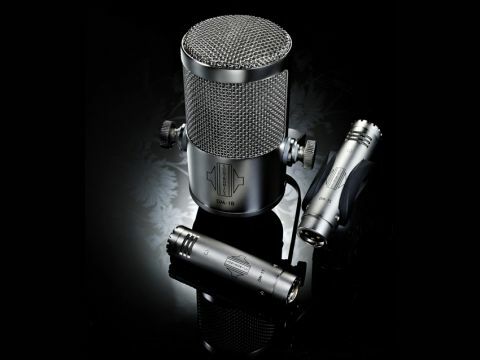 Sontronics have released three condenser mics to tackle the main skins in close drum miking. The large diaphragm DM1B is an end-fire cardioid developed specifically to work with the kick drum. The DM1S and DM1T models are response-tuned specifically for snare (S) and toms (T). The latter two come with shock absorbing mounts for direct placement onto the drum itself and all three mics have a single inset pad switch: -15dB for the DM1B and -10dB for the DM1S/T. First off this mic has a very high SPL handling limit (155dB SPL with the pad) so no matter how heavy footed the drummer it will not go 'plop' mid-session (we did try). The DM1B has a relatively open HF range which helps keep the transient response fast and lively while capturing a sense of air and space when used outside the drum. At the other end of the spectrum there is plenty of bass extension without sounding overblown like some well known dynamics. The real character of the DM1B is in the low-mid and mid range where it sits farther forward than nearly all the other mics we usually put on kick drum duty. For big rich Jazz bass drums, the mids may need a little reigning in, but this requires gentle EQ cuts and not phase-upsetting boosts. The snare and tom oriented models are similarly clear and well delineated in the mids. The biggest balance challenge for snare drum recording is between the low-mid body and the high-mid crack/smack. The HF extension one expects from a condenser is there and helps remove that slight phase mismatch that dynamics can produce when mixed forward from overheads and room mics. This does bring the hi-hat bleed into sharper focus, but not in a way we find problematic. The DM1Ts capture a full and present tom sound with a good transient punch. Our only criticism of the DM1S/T models is the drum rim mount which we found tricky to get clamped evenly while the curve of the arm places the mics too far over the skin for our taste, though they can always be stand-mounted. As a set the Sontronics DM range blend well and capture a clear up-close picture of the drum kit with little need for EQ in the first instance. Compared to a set of traditional dynamics the DM mics present just as much body but with a HF clarity that makes many dynamics seem a little nasal. They also avoid the scooping effect of many condensers and instead bring the drums right up to your speakers, rattling lugs and all. The DM1S and DM1T are priced competitively and should be seriously considered if you regularly record drums and already have a few pencil condensers for other tasks. The DM1B is a more expensive proposition (at £299) but for us is the standout model, presenting as it does an unfettered analogue of the kick drum. Sontronics also make mention of the DM1B as an all-round bass instrument mic so we tried it for bass amp recording with great success, especially for aggressive Rock and Funk tones.